Field walking was carried out in field 334930 in September 2009. The work on this field was carried out following the ploughing of the field for the first time in fifteen years. The farm staff noticed while working that there were large quantities of glass and other material appearing as the soil was turned. The farm staff also recovered a number of complete glass bottles and jars. The field was steep sided with a central depression which widened significantly at the eastern end of the field. The eastern end of the field was also heavily waterlogged with the remainder of the field draining into this area. A baseline was set up along the eastern end of the field and a system of 10x10m grids set out. The concentration of the material clearly visible on the field surface was based in the eastern end of the field and the decision was made to undertake a 100% collection from this area. 20% collection was undertaken for the remainder of the field. The field walking was carried out by a number of local volunteers. A total of 2443 finds were recovered during the field walking. These finds were cleaned and recorded in an MS Access database. 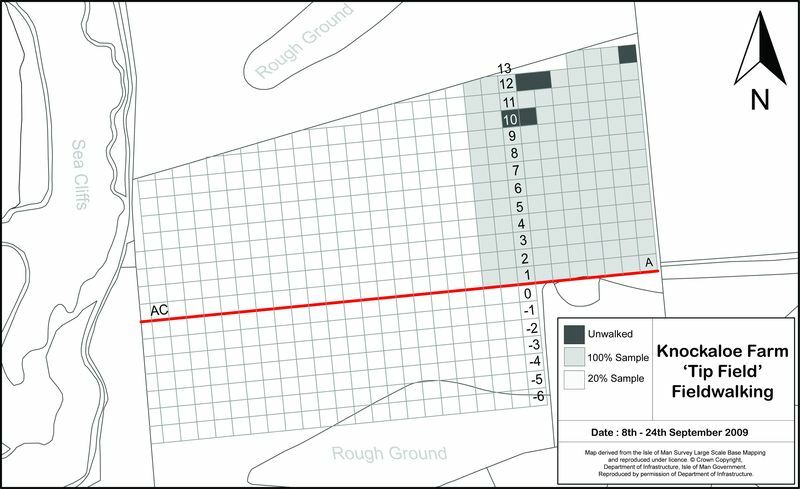 Due to the large quantity of finds recovered it was possible to keep every object and the decision was made in conjunction with Manx National Heritage to retain a selection of all the different find types along with anything particularly unusual or containing any information or identifying features. 449 finds of a variety of material types including ceramics, leather, wood, bone and glass were then deposited with Manx National Heritage. Given the concentration of finds within the field and the vicinity of the field to the location where the sites waste pipe enters the sea it seems likely that the field represents some kind of rubbish dump or tip for the camp. This is compounded by the very high levels of cinders and fire waste found in amongst the finds. Local opinion suggests that there was indeed a tip in this area although opinions were divided as to whether the tip was from the camp or a later dump from the nearby city of Peel. The discovery of a number of finds with German text would suggest the material is in fact from Knockaloe. Further discussions with local people suggested that much of the general waste was thrown over the cliffs at the rear of the camp just beyond this field although there is no evidence to substantiate this. What is possible however is that the material uncovered in this field may represent the clearance of the camp at the end of the war. The range of finds is vast with glass being the predominant material type, although many of these finds are very small fragments. There are however a number of complete bottles including ink wells, medicine, and soft drinks bottles. There is also a considerable range of ceramics ranging from stoneware and representing a wide variety of styles and purposes. Practical items are visible such as enamel bowls and metal spoons along with the remains of several toothbrushes made of both bone and Bakelite. Personal items such as possible identification tags, pipe fragments, collar studs and hair combs were recorded along with fragments of leather shoes. Evidence of daily activities can be seen in the form of paint pots, a watering can rose and even a gaming piece.